An amplitude specimen decreases the intensity (i.e. the amplitude) of the light. 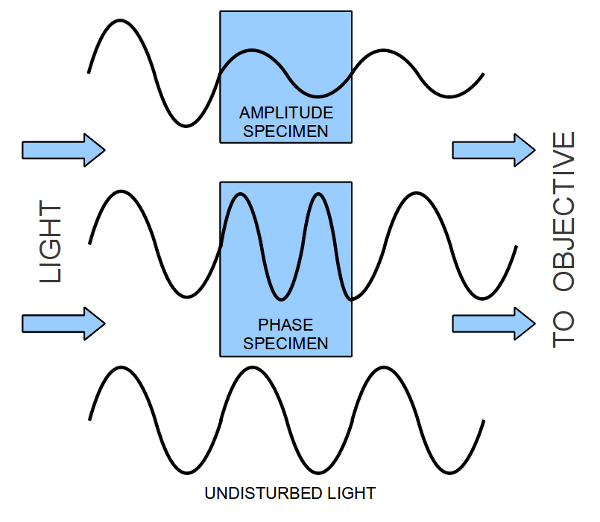 Phase specimens cause a phase shift of the light. This phase shift can not be detected with the unaided eye and requires a phase contrast microscope. Air is completely transparent, I hope you agree. And water is transparent. If this is indeed the case, then why is it possible to see air bubbles in water? The answer is, that the bubbles have a different refractive index than the surrounding medium, the water. Phase contrast microscopy is now capable of converting a difference in refractive index into a difference in brightness. The optics of the phase contrast microscope would make objects appear brighter or darker (depending on the optics used), thereby increasing their color contrast with the surrounding mounting medium. Specimens that do not possess much color but a different refractive index that the surrounding mounting medium can be referred to as phase specimens as they cause a phase-shift in of the light. The unaided human eye is not capable of detecting this phase shift. This phase shift is then converted into a brightness difference by the optics of the phase-contrast microscope. Bacteria are a good example here. They are nearly completely transparent but nevertheless appear darker or brighter (depending on the optics) than the background. 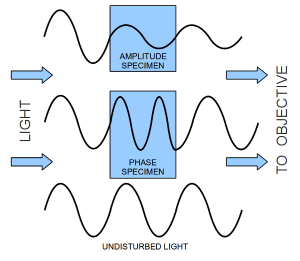 Amplitude specimens possess a color and are able to decrease the brightness of the passing light all on their own. These specimens are best observed using bright-field microscopy. Pigmented structures (such as chloroplasts) and specimens that are selectively stained are examples. Many specimens are a combination of these two. Here the choice of the right kind of microscope is important in order to see that what one wants to see. Phase contrast microscopes will optically darken certain structures to the extent that it is not possible to see the natural color of the structure. In this case it is probably better to use bright field microscopy. Stained bacteria, for example, should be observed in bright field. The optics do not change the color of the observed structures. Sometimes stains are used to make certain structures visible. The optics of a bright field microscope do not change these colors. Bright-field microscopy requires fewer adjustments before one is able to observe the specimens. It is possible to visualize certain structures that are otherwise invisible. This includes certain cell organelles which can not be seen well in bright field. Sometimes the phase contrast image subjectively looks better than a bright field image due to the details visible. Please, what’s the relevance of these microscopes to obstacles in spontaneous generation?Thanks. The answer can be sent to my e-mail address. It can be published. Microscopes can be used to check whether microorganisms are able to appear by spontaneous generation. Obsolete by now, because Louis Pasteur has already shown that spontaneous generation of life does not occur. You may try using polarized light for this project – fish scales are anisotropic and relatively birefringent, so these should have some effect on rotating plane polarized light.